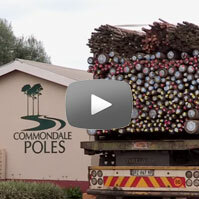 We offer a choice of quality treated poles and CCA treated products. Our range includes SABS approved Gum Poles, Garden Edging, Droppers and Thatching Laths. Commondale Poles was started in May 1999 with a vision to help local farmers realise their full potential out of their farming enterprise. Our aim is to produce poles treated to the best standard and of lasting quality. We are based in Commondale, Mpumalanga. Our poles conform to particular SABS specifications ensuring consistent quality, straightness and uniformity in size. Contact us for all your pole and treated product requirements today.